Epidemiologic studies document a lower prevalence of major depression in Blacks than Whites in the United States. This is paradoxical from the perspective of social stress theory. A long-standing claim in the (clinical) literature is that Blacks express depression more somatically than Whites. If true, the diagnostic algorithm may undercount depression in Blacks, since the screening symptoms privilege the psychological rather than somatic dimensions of depression. We test hypotheses that (1) Blacks express depression more somatically than Whites which (2) reduces their likelihood of endorsing screening symptoms, thereby undercounting Blacks’ depression and explaining the Black–White depression paradox. We use cross-sectional data collected in 1991–92 from the National Longitudinal Alcohol Epidemiologic Survey (n = 42,862) among Blacks and Whites endorsing at least one past-12-month depression symptom. 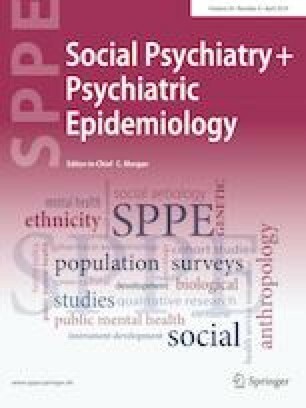 We compare groups on depression somatization and test whether greater somatization in Blacks leads to lower endorsement of psychological screening symptoms, and therefore under-diagnosis. Blacks have higher mean depression somatization scores than Whites (0.28, SE 0.04 vs. 0.15, SE 0.02), t(122) = − 2.15, p = 0.03. This difference is small and driven by Blacks’ higher endorsement of 1 somatic symptom (weight/appetite change) and Whites’ greater propensity to endorse psychological symptoms. However, Blacks have the same odds as Whites of endorsing screening symptoms, before and after adjusting for somatization. We find minimal evidence that Blacks express depression more somatically than Whites. Furthermore, this small difference does not appear to inhibit endorsement of diagnostic depression screening symptoms among Blacks, and therefore does not resolve the Black–White depression paradox. The authors thank Sharon Schwartz for her insightful comments on this manuscript.